The Social Security Administration's main campus in Woodlawn, Md. The Congressional Budget Office released its “2014 Long-Term Budget Outlook” this month, projecting Social Security and health-care spending to result in “unsustainable” federal deficits through the next quarter-century. “Unsustainable” might be an appropriate term for the seemingly lackluster interest from Capitol Hill lawmakers, outside of Utah Republican Sen. Orrin Hatch and a few others. The report, stated Hatch, is a stark reminder of the urgent need for entitlement reform. However disconcerting the spending and revenue projections are, they seem buffered by the timetable — worrying about federal finances in 2029 and 2039 is so distant and not that disturbing. The federal debt is projected to reach 106 percent of the economy (gross domestic product, or GDP) in 2039, up from 73.8 percent projected for this year and 78 percent in 2024. That 106 percent is actually 4 points higher than last year’s CBO projections, given the slow economy. By 2039, federal spending for Social Security, Medicare, Medicaid, the Children’s Health Insurance Program and subsides for health insurance purchased through exchanges created by the Affordable Care Act would be 14 percent of the GDP, as opposed to the 7 percent over the past four decades. With increased spending on entitlements such as Social Security, major health-care programs and net interest payments, other federal discretional spending — infrastructure, education, defense and such – will drop to 7 percent of GDP in 2039, well below the 11 percent of the past four decades and the lowest share since the Great Depression. Medicare, Medicaid and other health-care entitlements currently account for 4.8 percent of the GDP, and Social Security 4.9. Projected levels for 2039 are a whopping 8 percent for health care and 6.3 for Social Security. Actually, the feds’ financial picture right now isn’t dire, given budget cuts and tax increases. The CBO projects a U.S. budget deficit of $492 billion this year, the lowest since 2008 and nearly a third of the record $1.4 trillion in 2009. But even the currently low deficit and projected healthy revenues won’t be enough to halt the anticipated rise in future deficits. Also, Congress can’t continue to rob Peter to pay Paul, taking moneys out of one Social Security trust fund to prop up a like fund or another outside federal financial need. It only postpones the inevitable. Americans are hesitant to see reductions in Social Security benefits. A recent Pew Research Center study shows 67 percent want no reductions at all in benefits, while 31 percent say future reductions should be considered. 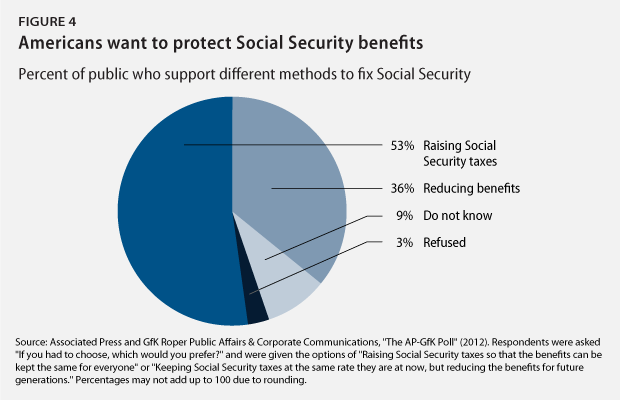 In a 2012 AP/GfK national poll on Social Security’s future, 53 percent preferred maintaining current benefits by raising Social Security taxes, while 36 percent wanted to keep the tax rate as it is but reduce benefits for future generations. While Congress has some tough decisions ahead: to substantially increase the economy, cut additional spending, raise taxes more, limit the growth of the entitlement programs or do a combination of several. Whatever is done in the near-present may hurt the economy some and result in short-term pain. But continued procrastination only means greater pain in the long term.